does anyone know if it's possible to do it this way? i could create a image to be the same background for the songs but id like to be able to have the album or artist name between the songs like the default skin does it. There is no way to do this. If a "classic" style layout is selected, album art isn't even processed. I'm using a 7" touchscreen and all the skins were just to small text wise on the small screen so i have made this skin specifically made for 7" screens altho it will work nicely on a bigger monitor you would just have less songs showing up. as for the skin i dont have anywhere to upload it if anyone wants it im guessing chris will host it on his website maybe? Nicely done... E-mail it to celamantia@gmail.com and I'll put it up. It is posted at http://dwjukebox.com/category/skins . Hey chris do you still have the skins dragster sent you? I think so... I was hesitant about putting up the ones with trademarked logos in them, but I should still have the original files. Sometimes I think simpler is better. And I have a smaller LCD screen that I thought about incorporating into my juke and this type of skin would work nicely with just a couple tweaks to match my button setup. My setup has two menu similar to your skin, but there are 100 songs in each side. You can't actually see all 100 because the menu drops below the visual size of the screen. 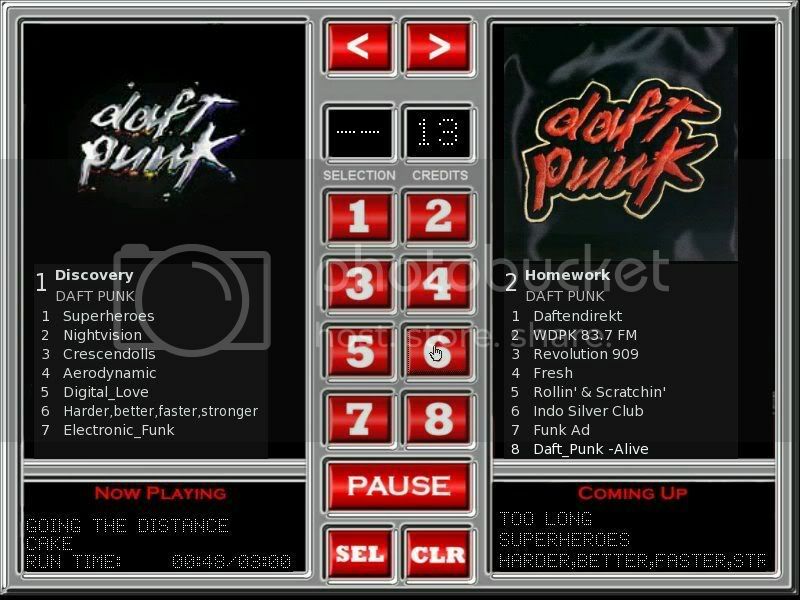 But right now I don't even use a visual screen, right now it's just there to make the software function with my jukebox. My skin is only for functionality at the moment..... not meant to be pretty. (cuz you don't see it) But I would like to create something more visually pleasing in the future. Still tossing around ideas for it though. No, not yet... since the jukebox is designed to emulate a mechanical jukebox, I don't know if I'll be adding those sorts of "video jukebox" functions. It'd be tricky for a non-touchscreen setup.